Airport safety wands - measuring 13" in length, used for marshalling aircraft as well as directing vehicle traffic. This brand new Heavy Duty Safety Wand was developed for the Military and made to withstand severe service. 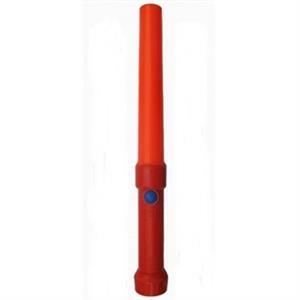 This Heavy Duty Airport Safety Wand - On/Off, with 13" length, is a hand held, battery powered warning light wand that makes you visible to attract aircraft taxiing off the runway or taxi way. Designed as a durable, quality built, essential equipment for aircraft and traffic control, this marshalling wand quickly attracts attention and has found wide acceptance by police, emergency medical crews, construction crews, fire departments and airport aircraft supervision staff. Lighted cone area is 7"